Join us for the Experience the Estuary Celebration on September 27, from 5:00 to 8:30 p.m., in Claymont, Delaware. 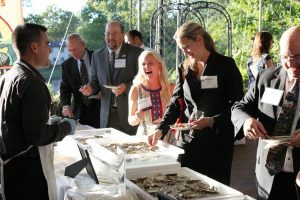 Guests will dine on fresh Delaware Bay oysters with fellow enthusiasts of the Delaware River and Bay. This fundraiser will take place at The Waterfall, conveniently located off I-95 and I-495. This event includes a 3-course dinner, silent auction, networking opportunities, and more. Click here for more information.